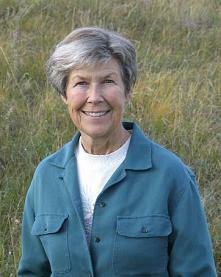 Nora Stewart, Saskatchewan native plant enthusiast and author of "Cultivating Our Roots"
Nora Stewart is well known among native plant enthusiasts for her work in growing our prairie plants and motivating others to appreciate and use them. Although raised in Toronto, Nora developed an affinity for nature during summers spent at her grandparents’ isolated cottage. After biology studies and marriage, she moved to the Qu’Appelle Valley in Saskatchewan where she quickly connected with the native prairie ecology. Later, when she realized that it was difficult to buy seeds of the prairie grasses and wildflowers, she established a seed farm at her present home in the Moose Mountains of south-east Saskatchewan. Now, after nearly fifteen years in the business, she has retired and with this book is passing on what she has learned about growing these plants.